About a year ago, I read an article in the Boston Globe about an elusive British street artist known as Banksy. 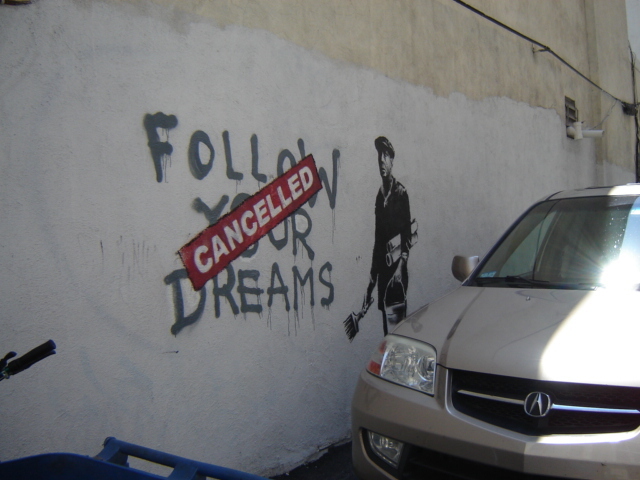 Some Banksy-style art had appeared on a restaurant wall alongside a parking lot in Chinatown, and rumors were flying that Banksy himself had snuck into Boston under cover of darkness to make his mark. My office is quite near Chinatown, so with very few clues, I set out one lunch hour to find the art. A woman thought I looked lost. She was sure she knew where the restaurant mentioned in the newspaper was located. She didn’t actually, but I followed her a while and had a nice chat. She was amazed to hear what I was looking for: “Banksy? Banksy was here? !” It took a couple lunch hours, but I finally got this picture. And I wasn’t the only one taking pictures. The parking lot attendant looked very annoyed. A year later the art is covered with ordinary graffiti, sprayed-on tags. I never did hear if it was an authentic Banksy, but I really like it. If you want to know more about street art in general and Banksy in particular, see the offbeat documentary “Exit through the Gift Shop,” in which Banksy has to come to LA to rescue a street-art exhibition that takes in an awful lot of people.